WackyPuppy designed and launched a Google AdWords campaign focused on reaching youth interested in basketball camp or strength training in the Santa Barbara area. 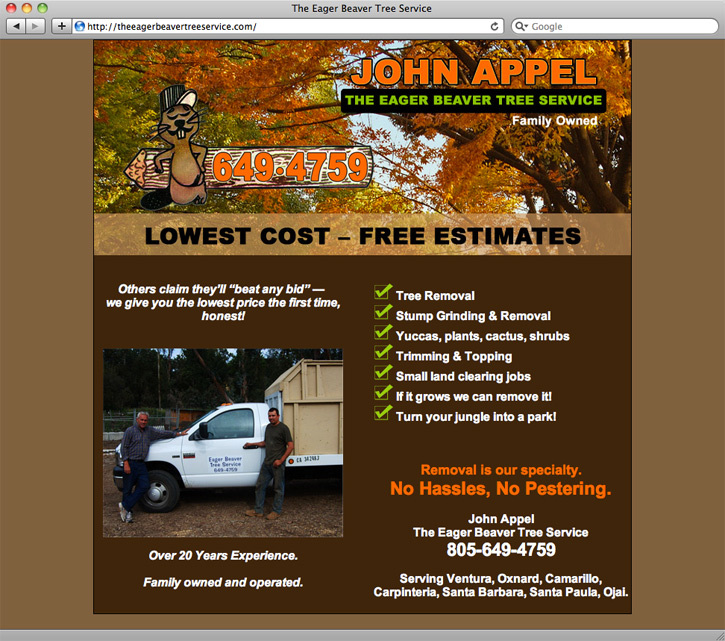 Designed and managed and Google AdWords campaign for The Eager Beaver Tree Service, based in Ventura, California. The campaign has proven more effective than yellow pages advertising for generating leads and for helping existing customers find them. Designed and implemented a Google AdWords campaign for this progressive private school that serves children from pre-K through 12th grade. Our goals were to explore alternative methods to increase awareness of Oak Grove’s offerings to potential boarding students. At the time of this test, it was found that the return on investment was not good, but more recently, with the increasing rate of search amongst prospective students, Oak Grove is revisiting Google AdWords as a marketing tool, and is managing their campaign in-house. If you are a nonprofit, be sure to check out Google Grants to see if you qualify for free advertising from Google. We can help you get started. In their very first year, we knew there was a market for Ventura WILD, a local start up devoted to getting kids out into nature. Our challenge was how to get the word out late in April, when most print ads for summer camps had already gone out. WackyPuppy created and managed a closely targeted successful Google AdWords campaign that resulted in a good return on investment, and several new campers for the program.